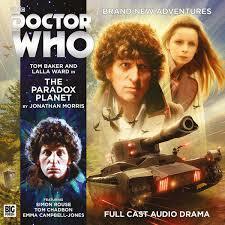 Series five of The Fourth Doctor Adventures continues with Jonathan Morris’s ‘The Paradox Planet,’ the opening story of two which sees the Doctor, Romana, and K9 struck by a Time Tank in the vortex and finding themselves trapped on opposing sides of a temporal war on the planet Aoris. As the TARDIS crew soon finds out, soldiers from the future are attacking the past of their own planet while collecting valuable resources and endangered animals, at the same time trying to avoid and fight off planned attacks that have been lying dormant for generations. A planet at war with itself in different eras is a fascinating concept, especially when considering the calculated moves that the future’s soldiers need to make to avoid a misstep that could result in a disastrous paradox. Romana being split up from the Doctor seems to be a recurring theme this series, and that happens again thanks to the surreal events of the opening ten minutes, but placing a protagonist within the machinations of each side is a necessary move that allows for the understanding- if not the sympathizing- of both sides. Likewise, at least so far, expanding this conceit into two releases allows for a much more thorough exploration of the supporting characters’ actions and motivations. Though the story, out of necessity, focuses on just a few of the key players from each side, everyone acts in a logical manner and stays true to his or her own cause. In quick succession, Simon Rouse’s Drang, Tom Chadbon’s Embery, Paul Panting’s Fyrax, Emma Campbell-Jones’s Shola, Laura Rees’s Tyrus, Bryan Pilkington’s Lostar, Jane Slavin’s Medea, and John Banks’s Valchak all provide suitably engaging and meaningful performances as events unfold. ‘The Paradox Planet’ is not afraid to take advantage of its extended running time when paired with the upcoming ‘Legacy of Death.’ As such, information about the choices and events is more slowly and deliberately revealed than in many of this range’s releases, allowing the listener to formulate opinions fluidly based on the changing scope of detail. Never is it explicitly stated that one side is right and the other wrong. It’s a welcome change of pace more in line with the classic series, and it’s a fascinating process to discover more of the underlying reasoning for characters’ decisions on both sides alongside the Doctor and Romana as it slowly leaks out over time. The regulars are absolutely pitch perfect in this release, firmly recapturing the feel of their time on television. Both Tom Baker and Lalla Ward, despite the severity of the situation, manage to retain a sense of wit amongst the proceedings. That wit combined with her continued show of intellect prove again what a unique and valuable companion Romana is, and her unabashed haughtiness as she comments on the technology and the lunacy regarding orders is true to form. Neither character is completely on the sidelines watching the action, though, and even if these events do resolve themselves rather simply, Romana is presented with an impossible moral dilemma and the Doctor literally faces a ticking time bomb as events progress. Refreshingly, though, K9 also gets a meatier role than in recent tales, sharing a surprisingly touching moment with the Doctor and positioned to be a major component to events in the conclusion. Even if the tone of events isn’t the most sinister, the raised stakes certainly present intriguing situations and solutions for everyone involved.